Like any other tank owner, I’ve spent time trying to find the right filter to use for my aquarium. I’ve found that canister filters work best for me, but even going between two different model filters from the same company you can sometimes find a good deal of variance. Recently, people had been telling me about SunSun, so I figured a SunSun canister filter review was in order to see what the buzz was about. You’re probably already well aware how crucial a filter is to keep your tank healthy. Keeping your tank water clean and filtered means your fish will have fresh oxygen, and don’t have to bear the burden of swimming about in their own waste. 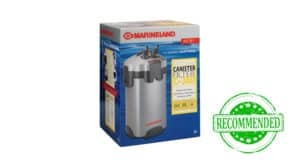 When heading out to get a canister filter, though, there are a few things that you’ll have to keep in mind, as canister filters function a bit differently than your run-of-the-mill box or gravel filter. 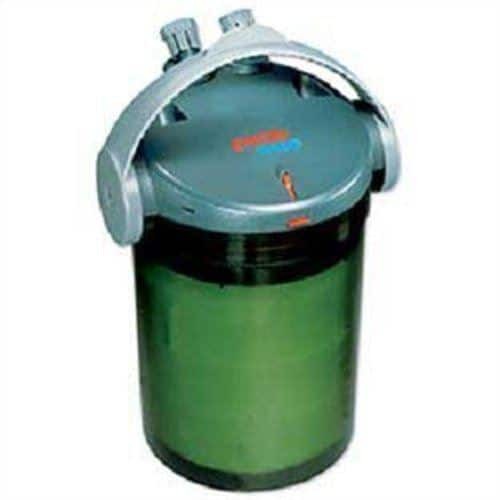 Canister filters are the big boys of filtration systems. 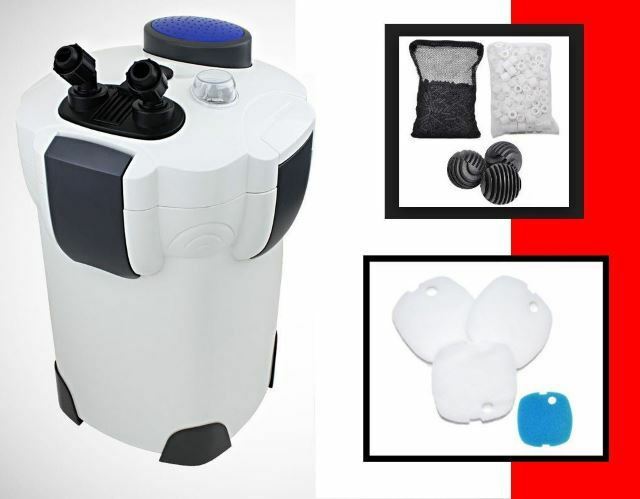 If you’re interested in one, you probably have a larger tank, so getting a filter that can purify large amounts of water at high speeds is essential. The max tank volume and GPH are going to be two important numbers for you. Because you have such a large amount of water in your tank, a filter that has multiple methods of treating the water is necessary. For you to consider any canister filter, it should at least provide you with the big 3: mechanical, chemical, and biological filtration. You’ll also want to consider additional details, like power consumption, ease-of-use, and the size/weight of any potential filter. 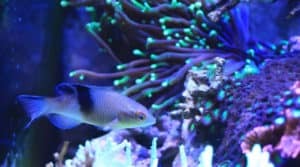 If you have a smaller tank or aren’t prepared to drop more money, you should probably consider going with a box, gravel, or power filter instead. This filter is somewhat plain in terms of looks. The shape is functional, but lacks flair, and it’s constructed from a flat white plastic that further accentuates the antiseptic feel of the device. Of course, that might be just what you want from a machine that’s designed to clean water! The durability is on par with other models out there. Sturdier brands like the Eheim are out there, but the difference isn’t so great that it counts against the HW-304 in any significant way. The locking mechanisms are robust and it locks on multiple sides to ensure security. there are 4 of them means you can load them up with the filtration agent of your choice for the precise clean you need for your tank. 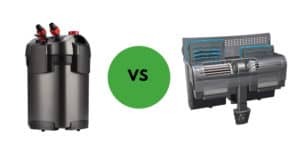 As mentioned, the filter is somewhat bigger, weighing about 17 pounds, (causing some hassle when it’s time to move it and clean it), but being an external filter, you can easily set it on the floor and out of the way until it’s time to do so. You can get a good look at the filter, and it’s components here to judge for yourself. The instructions included with this filter are, quite simply, terrible. If you don’t have any experience with canister filters, you’re going to be in for a rough time. Luckily, in the digital age, YouTube is your friend. There are some good setup tutorials online, but it still might take you a while to get the hang of it. Like some other filters, those hoses can be a bear to work with at first. Once you get them more pliable though (the hot water method works pretty well), they do their job as intended. If you’re more of a pro, you can go with some custom made tubing and eliminate the need to work with the stock hoses. The self-priming feature works pretty well and takes a lot of the hassle out of the operation of this unit. You might not ever need to do any manual priming. If it becomes necessary, though, just a few pumps on the priming button and you should be good to go. I’ve heard others say this filter runs whisper quiet. That was not my experience. It’s not the noisiest filter around, but it does make more sound than just a whisper. This is exacerbated if you experience leaks or issues with the flow from the hoses, but there is a simple fix if you find yourself in such a situation. As far as the pumping power, it works well, as advertised. Of course, the GPH dips once you have all of the media installed, but you can use this to control the flow rate (since there’s no flow rate nozzle attached). Pack in the amount of media you want for the desired GPH. Once everything is set up as it should be this filter will continue to run. You can operate it continuously with few to no issues. Speaking of the media, they do a great job at keeping the water clean. The carbon pads catch hold of tiny particles to remove them from the water, while ceramic rings and bio balls handle the chemical and biological filtration, respectively. Swapping media out is no hassle, just slide the trays out and put in/take out what you need. The addition of a UV filtration light is a definite bonus. 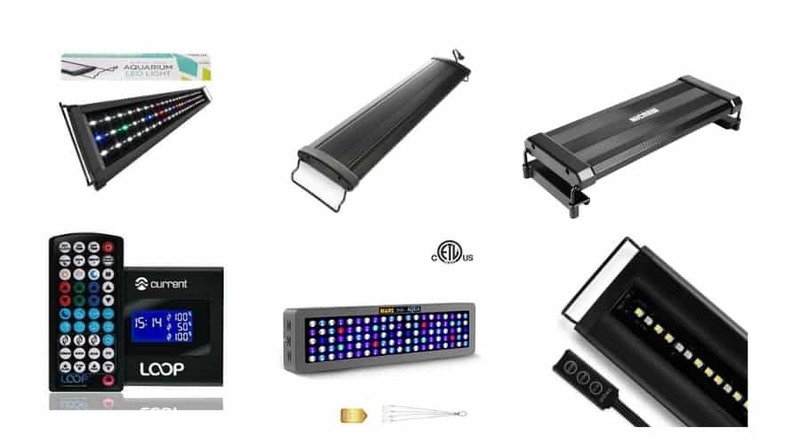 UV light is well known for its ability to purify water, removing algae spores and harmful bacteria. The 9 watt UV lamp on the HW-304 has excellent output and operates well in 2-hour shifts. The spray bar is included, and the tubes it uses are multi-length, so you can combine them to customize the direction and positioning the way you see fit. SunSun is really giving you a lot of filter for your dollar. A high-power canister filter can easily cost several hundred dollars, but the HW-304 comes in at a decent price. Sure the setup is a bit tricky, but once you have it running it works at a level comparable to many pricier filters, and comes with the bonus of a UV filter as well. This part is a breeze. Just take your filter to the sink, and get to washing. Make sure you use tank water to rinse your filters to preserve all of the good bacteria that help promote filtration. You can disassemble the filter into its component pieces to get every part as clean as possible. Reconnecting everything once you are done should be a snap since you’ve already loosened up all of the hoses and know the assembly process by this point. 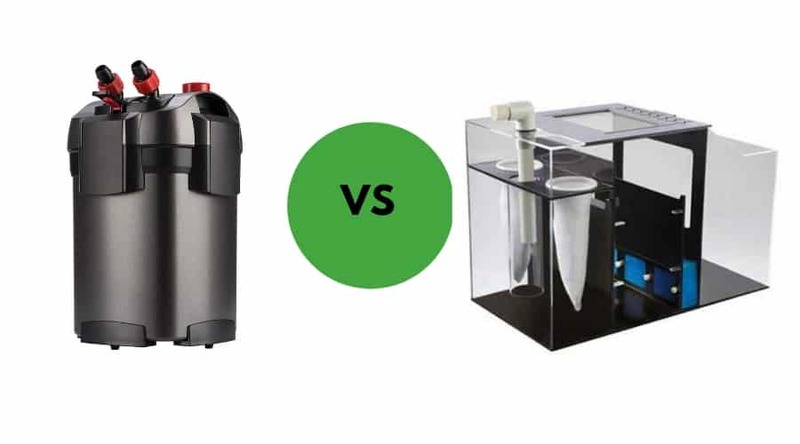 The EHEIM Ecco Pro 2236 is another filter you may want to consider if you’re more of a first timer. The Ecco is easier to set up, provides increased energy efficiency, comes equipped with all the media you will need, and is considered to be more durable in its construction while still being lighter weight. You’ll have to pay more, however, and the Ecco doesn’t have the capacity of the HW-304, coming in at only 80 max gallons at 198 GPH. 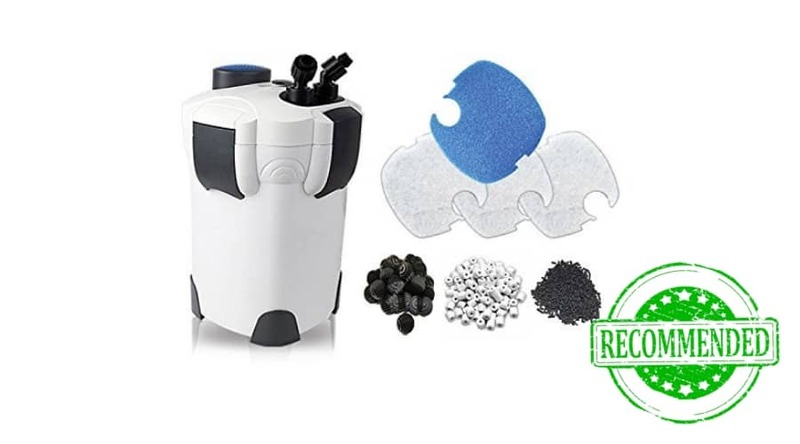 Again, great if you’re a beginner or have a smaller tank, but inadequate if you’re looking to filter more water in less time. 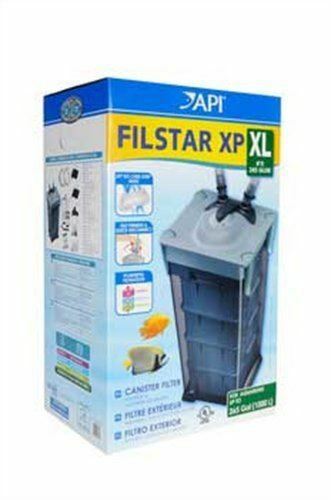 The Filstar XP-XL Canister Filter is an excellent alternative for those looking for large capacity and power. The XP-XL is designed for tanks up to 265 gallons at 450 GPH. Like the HW-304, it has four media trays for superior multi-stage filtration. It also has an integrated flow control, anti-overheating motor safety features, and operates very quietly. You’ll have to fork over some extra cash for this model, though, about twice what you’d pay for the HW-304. It also lacks a spray bar, and some of the components are put together rather cheaply in comparison. The Cobalt E-X-T may be a viable option for those desiring more energy efficiency, noise reduction, and superior filtration. The filter only has an energy draw of 6 watts. The design is such that it doesn’t require the large motor head found on other filters. 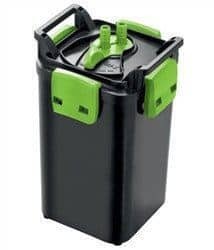 Although it lacks the max size and flow offered by the HW-304 (only 55 gallons max at 210 GPH), it also contains four media baskets, along with a UV light to deal with pesky algae. 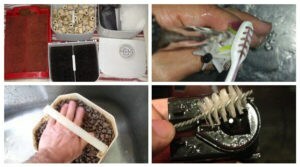 It is also easy to disassemble and clean, and will work both in and out of the tank. 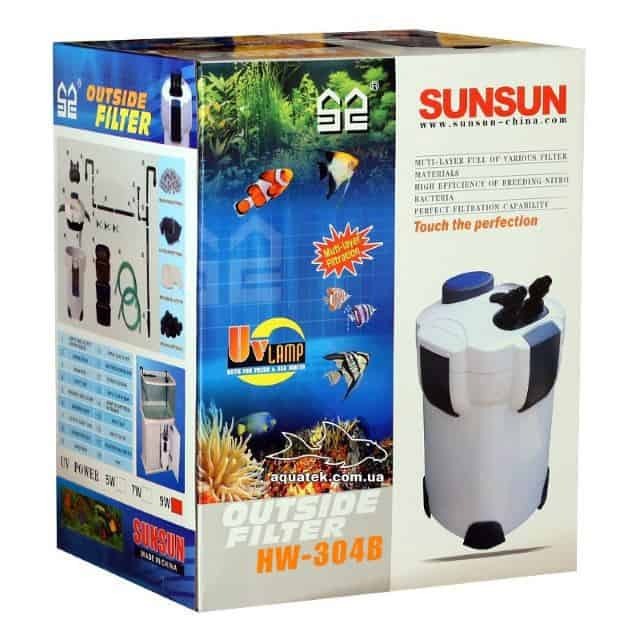 Here’s hoping this SunSun aquarium canister filter review helped you in considering your options. For those looking to upgrade to a more powerful filter that can compete with other high-capacity filters on the market at a fraction of the cost. The HW-304 is an excellent option. 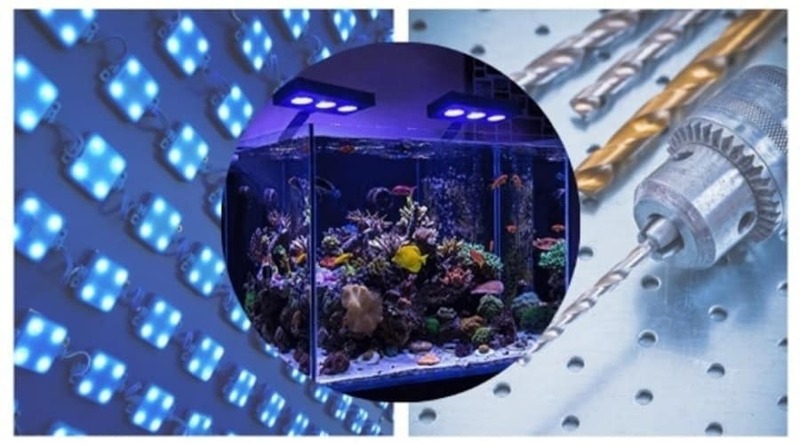 The inclusion of 4 separate media trays along with the UV light does a good job at keeping tank water crystal clear for extended periods of time. I have a sun sun hw304b canster filter, the handles are broken and it’s leaking a lot, can’t find replacement handle’s for the sun sun canster filter hw304b, can anyone help me find New one’s, I not having any luck.